Speaking about the initiative, Ashwin Gedam, Vice President, Global Marketing, Xpress Money, said: "We set out to do something different this Ramadan. Iftar is a time when friends and family get together to break their day long fast. 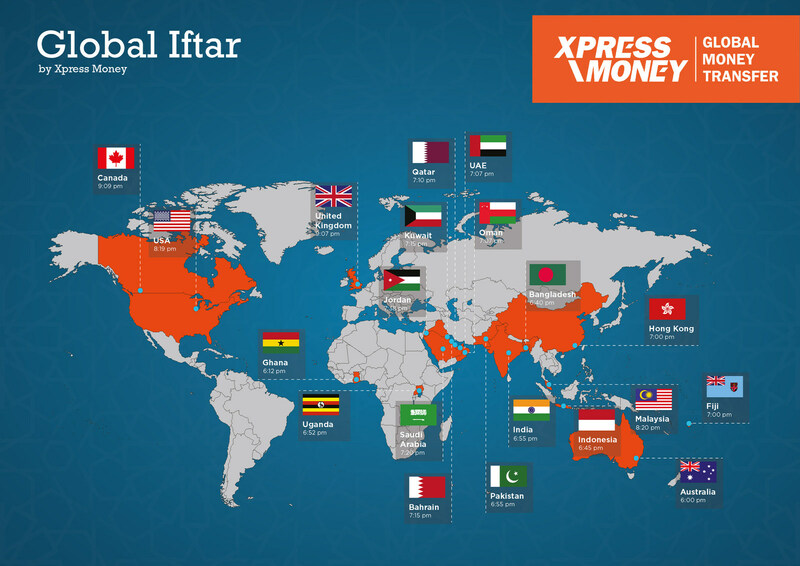 As the Xpress Money family, which consists of customers and partners, is spread across the world, this year we decided to organize a Global Iftar on the same day across 20 countries with the aim of sharing Iftar meals with our customers across the globe." Imran Waheed, from Shan Travel, an Xpress Money agent in Southall, United Kingdom said: "Ramadan is a very special time for millions of Muslims across the world and breaking fast together is a big part of the community. It was a fantastic moment for my store and our customers were very glad to receive such a wonderful gift from Xpress Money." For the last five years, Xpress Money has been organizing special Iftar distributions for migrant workers across Gulf Cooperation Council counties and has been part of various outreach programs supported by the Dubai Police. The Dubai Police were extremely supportive of the Global Iftar as Major Abdul Aziz Hassan Alshemmari, Head of Traffic Awareness Section - General Dept. of Traffic, Dubai Police and Corporal Omar Muslim Osman too broke their fast with Xpress Money's customers in Dubai.